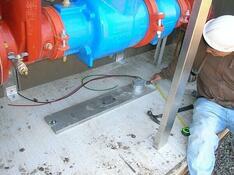 Safe-T-Cover's above ground enclosures are installed in locations across the US and Canada. We all know that North America spans many different climate zones. This means we need to be pros at keeping your equipment at the right temperature no matter what the weather's doing outside. We are used to receiving daily questions about our enclosure heaters and heating process. We know how important this topic is to you whether you're a distributor, engineer, water jurisdiction, building owner, or contractor. So, here are the answers to the seven most commonly asked questions about heating. This is probably the question we are asked most frequently. In any area where temperatures can fall and stay below freezing for a day or two, our recommendation is to add heating to the enclosure. This seems to be one of those pay me now or pay me later type decisions we all deal with. As a design engineer, specify an ASSE 1060 class 1 enclosure and you can rest easy knowing the owner will never call you and ask why the backflow device is frozen and who will be paying for an expensive backflow replacement bill. This is not to mention the losses due to the building being without water until the repair is made. We routinely sell heaters for projects in the traditionally warm southern states of Texas, Louisiana, Mississippi, Alabama, Georgia, and on occasion in Florida. Mother Nature can surprise us, even Florida and Nevada can freeze sometimes. This blog post about backflow cages goes into more detail. Another common question is what enclosure heater will I need? 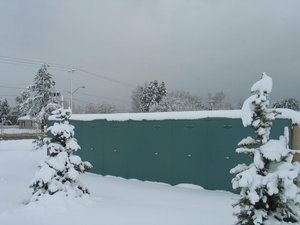 If you want the enclosure to prevent the backflow device from freezing, enclosure manufacturers can provide an ASSE class 1 heater which will keep the enclosure at 40 degrees F in temperatures as low as -30 degrees F. The heater for the class 1 enclosure must be UL 2021 certified for wet/damp environments. Not all heaters meet this criteria. We've talked about the different types of heaters backflow enclosure manufacturers sell before. You can read more about different hot box heaters here. Aside from making sure your heater is ASSE class 1 certified, you will also be looking for the correct voltage and wattage heater for your enclosure. The enclosure manufacturer can tell you how much heat is required to meet the ASSE 1060 class 1 requirement as the wattage varies based on the size of the enclosure. Our standard enclosures chart has the recommended heat for each of our standard models listed. Most manufacturers provide 120V heaters in sizes from 500 watts up to 2000 watts. Safe-T-Cover offers the 1000 watt and 2000 watt slab mounted heaters at 240V as well. You'll need to ask your manufacturer for more information on heaters with higher voltages and to discuss your needs. You should set the thermostat for wall mounted and slab mounted heaters at 40 degrees and the heater will maintain this temperature all the way down to -30 degrees F. Safe-T-Cover has sold enclosures for many years in Canada and in upstate NY where winters can be long and the temperatures are well below freezing for many days at a time. For more information, you can read our case study from St. John's, Newfoundland about how well aluminum enclosures perform in harsh environments. What types of heaters are available to choose from and how do they Work? The three common types of enclosure heaters are heat cables, wall mounted heaters, and slab mounted heaters. As with most items we purchase as consumers there is a "good, better, and best" option when considering a heater. Here's the good: a wall mounted heater. They mount to the inside of the enclosure and are very common. The problem is, most wall mounted heaters are not wet/damp certified as discussed above. This means they must be installed high up on the wall to avoid water damage. Since heat rises, the wall mounted heater is pretty much guaranteed to keep the top of the enclosure warm. It struggles to maintain the correct temperature for the riser pipes and the backflow device itself since the thermostat is installed in the heater, which is above the pipes on the wall. Here's the better: the self-regulating heat cable. This heater type is wrapped around the backflow device. However, most enclosure manufacturers only provide the heat cable option for small diameter pipes only. Here's the best: the slab mounted heater. These heaters are mounted directly to the concrete slab and heat not only the enclosure but the slab as well including the riser pipes below. This is because slab mounted heaters are wet/damp certified and can be installed without worry of water damage. The temperature gauge is mounted about 12" above the slab and therefore has a better ability to maintain the correct temperature on the device itself. This video on freeze protection gives a good overview of what makes the slab mounted heater the best option. How is the temperature controlled? Where is the thermostat installed? For smaller diameter pipe sizes, most manufacturers provide a self-regulating heat cable. This video from Instrument Specialties Inc. gives an overview of how these heating cables work. For the other two heating options, the wall mounted and slab mounted enclosure heaters, a thermostat determines when the heater will be energized. Most wall mounted heater thermostats are built into the body of the heater and are located high enough on the wall for the heater to be safe from water damage. 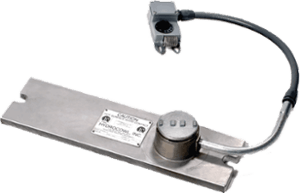 For slab mounted heaters, the thermostat is installed about 12” above the slab. The thermostat is set at 40 degrees and are designed to maintain this temperature inside the enclosure all the way down to – 30 degrees F. That is, if the heater satisfies the ASSE 1060 class 1 requirements. Be Prepared is the Boy Scout motto which means you should always be in a state of readiness. Here is how you can make sure you're prepared if the power fails in the middle of a cold winter day. 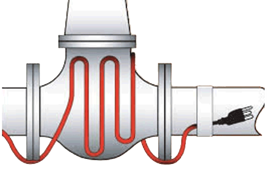 The first and foremost way to prepare against freezing pipes is to know the power has failed at the enclosure. 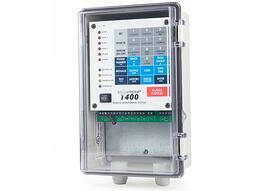 Most enclosure manufacturers offer temperature and power alarms. A common alarm model provides a strobe and horn at the enclosure. For remote monitoring, there are devices such as the Sensaphone Monitoring System which offer online or cellular notifications to the appropriate personnel by phone, text, or email if the power has failed or if the temperature falls below an established set point. We offer three different power and temperature failure alarms. The second way you can be prepared is to have a plan in place to provide some type of heating for the enclosure if it looks like the power might be out for an extended period of time and the temperatures will be below freezing while the power is out. A 9,000 BTU portable propane heater will more than replace the output of a 2,000 watt electric heater. A review of the major enclosure manufacturers revealed that most offer a one year warranty on the heater. Safe-T-Cover warrants to the original purchaser for a period of three (3) years from the date of original shipment that the HCH series heater is free from defects in materials and workmanship. You can read the full warranty information for our heaters and enclosures here. The staff at Safe-T-Cover is always happy to answer these and other questions you may have about aluminum enclosures and heaters in depth. Enclosure manufacturers want to ensure the best protection for your equipment. If you'd like to talk about your specific need, please give us a call at 800-245-6333 or contact us here.